It’s fun to talk about something you really like. And y’all, I really, really like this crate system for weekly clothing planning. Some of you might start reading this and think, “That girl’s crazy! Why doesn’t she just put her clothes in a drawer like a normal person?” I hear you, man. But ever since I implemented a crate system for weekly clothing planning… I can’t stop talking about it. This system just works for us. If you’ve already got something in place that makes getting ready every morning a breeze; then I say work it – you work it, girl. But if you’re struggling, maybe it’s time to make a change. I mean, if at first you don’t succeed, give it up and try something else. Every Monday, I put all the kids’ clothes for the week in their individual crate. I think about what is on our upcoming schedule – whether we are going to town or just staying home – and I put their outfits in order. Everything they’ll need for the week goes in the crates, including socks and underwear. I do something similar for Barry and me, but instead of crates, we just keep our clothes in the closet. Each Monday, we pick out all of our clothes for the week, hanging them back up in the closet in order of how we plan to wear them. In the morning when I get up, I just pull out what’s next in the closet. No decisions – no stress. 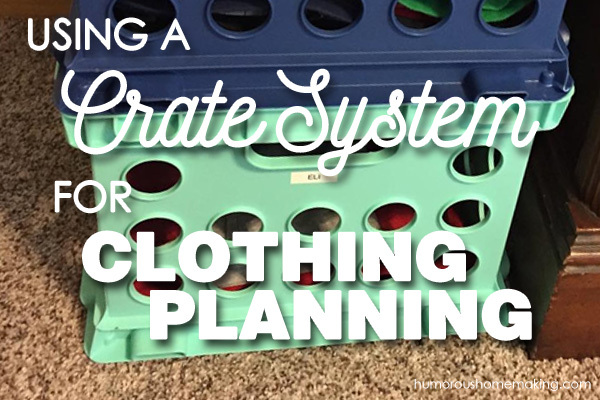 Why do we like using the crate system for weekly clothing planning? We don’t have to think about clothes for a whole week. Y’all I can’t explain how nice it is to get up in the morning and just pull clothes out of the closet and put them on without thinking about it. I don’t have to worry if my pants match my top. I don’t have to stress over whether my favorite Money Saving Mom shirt is clean. Because all of my outfits are already planned out, I just grab an outfit and get on with my day! I have control over what my children wear each day. I don’t want them covered in stains from head to toe on the days we are going out in public. However, I don’t really care what they wear if they’re just playing in the backyard all day. Annie is still okay with me choosing what she wears, but she is starting to pick out her own clothes and I suspect it won’t be long before she does all that on her own. My older children can get ready by themselves. They don’t come to me and say, “What should I put on today?” …Or one of my favorites – “Mom, I have nothing to wear!” No, they just go to their crate, grab what’s on top and put it on. It’s that simple. And it’s amazing. It saves so much time! We can all use some extra time, especially in the morning when things are crazy. With the crate system for weekly clothing planning, no one is walking around looking for their underwear. And you know why? Because their underwear are in their crate! The crate system for weekly clothing planning is awesome for traveling as well. I’ll be honest, I was surprised how much I like using the crate system for travel. I just put everything each child needs for any particular trip in the crate with their name on it. Everybody has their clothes and pajamas as well as their toothbrush, shoes, coats, etc. The crates stack up perfectly! I guess it might not work in a pickup truck, but works so well in the back of our van! When we are ready to head for home, the kids just pile everything back in their crate – dirty clothes and all. This system is a lifesaver for us. If you’re struggling and stressed over what to wear each day, maybe it’s time to make a change! Just please don’t keep doing the same thing over and over and over again thinking you’re going to get a different result. That’s the definition of insanity! 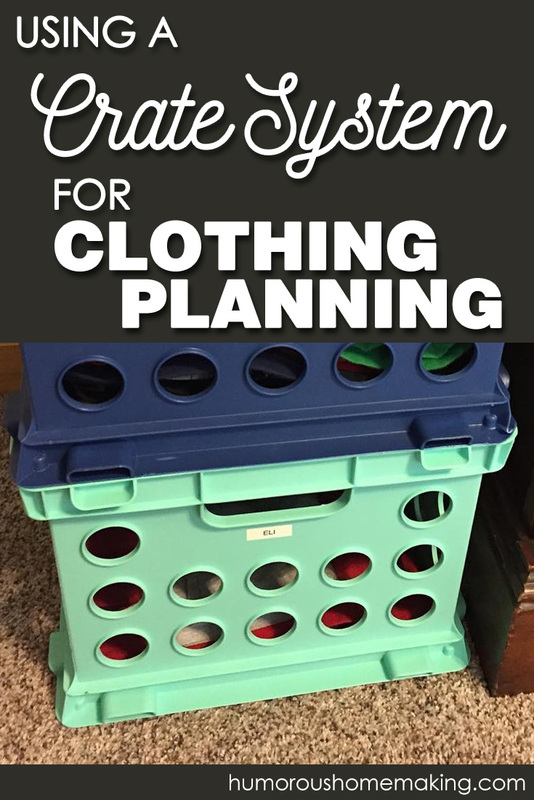 Well, there you have it: Stacy’s super simple crate system for weekly clothing planning. Whew, say that three times fast! Crate system for traveling! Yes. My hubs thought I was crazy the last time we went to visit my mom because I just threw (neatly) my stuff and our kids stuff into a laundry basket. It was so much easier than trying to find space in a suitcase or in a bunch of suitcases. I have seen suggestions for planning a week’s wardrobe at a time. Your box idea is great for kids who are still too small to manage pulling a drawer easily. I have also seen other organization set ups with seven hangers and a bag for extras like tights and undies to go over the hook. Thanks for the comment, Dine! 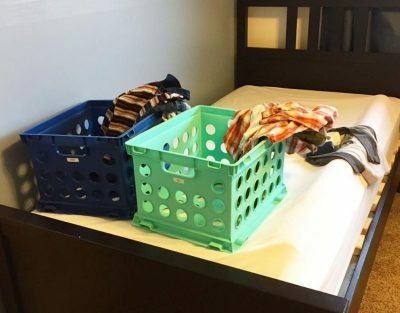 I personally love using bins or crates for that reason – no hangers or drawers to mess with!